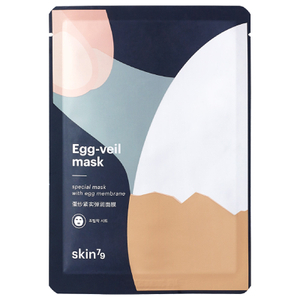 Improve the appearance of skin with the Egg Veil Face Mask from Korean skincare brand, Skin79, an intensely moisturising microfibre sheet mask infused with the nutrient-rich properties of Egg Shell Membrane. Delivering long-lasting hydration, the breathable mask helps retain skin moisture whilst softening and nourishing the face. Egg Shell Membrane is rich in Collagen Hyaluronic Amino Acid which contributes to improved skin elasticity and smoothness; wrinkles appear reduced and hydration is enhanced. Helping to improve the look of skin, the balancing face mask will regulate oil and moisture for a supple, healthier-looking complexion. After cleansing and toning, apply mask to dry skin and leave for 10 minutes. Remove mask and gently pat skin to promote absorption of excess serum. Water, Glycerin, Butylene Glycol,Hydrogenated C6-14 Olefin Polymers, Xylitol, Triethylhexanoin, PEG-32, Cyclopentasiloxaane, Peopentyl Glycol Dicaprate, Cetyl Ethylhexanoate, Methylparaben, Silica, Cyclohexasiloxane, Phenoxyethanol, Allantoin, Octyldodeceth-16, Acrylates/C10-30 Alkyl Acrylate Crosspolymer, Triethanolamine, Cetearyl Olivate, Sorbitan Olivate, Xanthan Gum, Ceteth-20, Steareth-20, Carbomer, Dipotassium Glycyrrhizate, Dimethiconol, Glyceryl Stearate, Cetearyl Alcohol, Ethylhexylglycerin, Disodium EDTA, Niacinamide, Hydrolyzed Egg Shell Membrane (100ppm), Fragrance, Sodium PCA, Tocopheryl Acetate, Saccharomyces Ferment Filtrate, Goat Milk Extract, Yogurt Filtrate, Milk Protein Extract, Nelumbo Nucifera Flower Extract, Prunus Mume Fruit Extract, Lactic Acid, Citric Acid Water, Glycerin, Butylene Glycol,Hydrogenated C6-14 Olefin Polymers, Xylitol, Triethylhexanoin, PEG-32, Cyclopentasiloxaane, Peopentyl Glycol Dicaprate, Cetyl Ethylhexanoate, Methylparaben, Silica, Cyclohexasiloxane, Phenoxyethanol, Allantoin, Octyldodeceth-16, Acrylates/C10-30 Alkyl Acrylate Crosspolymer, Triethanolamine, Cetearyl Olivate, Sorbitan Olivate, Xanthan Gum, Ceteth-20, Steareth-20, Carbomer, Dipotassium Glycyrrhizate, Dimethiconol, Glyceryl Stearate, Cetearyl Alcohol, Ethylhexylglycerin, Disodium EDTA, Niacinamide, Hydrolyzed Egg Shell Membrane (100ppm), Fragrance, Sodium PCA, Tocopheryl Acetate, Saccharomyces Ferment Filtrate, Goat Milk Extract, Yogurt Filtrate, Milk Protein Extract, Nelumbo Nucifera Flower Extract, Prunus Mume Fruit Extract, Lactic Acid, Citric Acid.